Lentil soup is hearty and filling, but it won't break the calorie bank if you stick to the suggested serving size. Its satisfying nature is mainly because of the high fiber content in lentils. Fiber contains no calories because your body can't break it down, yet it slows digestion to help your stomach stay full long after you've put down your spoon. Make your soup as lean as possible by skipping the bacon or other fatty meats. Like other broth-based soups, the high-water content in lentil soup makes it fairly low in calories. The exact calorie content varies, however, according to the recipe. Typically, canned condensed lentil soup contains about 140 calories per serving, which equates to 1 cup of prepared soup. 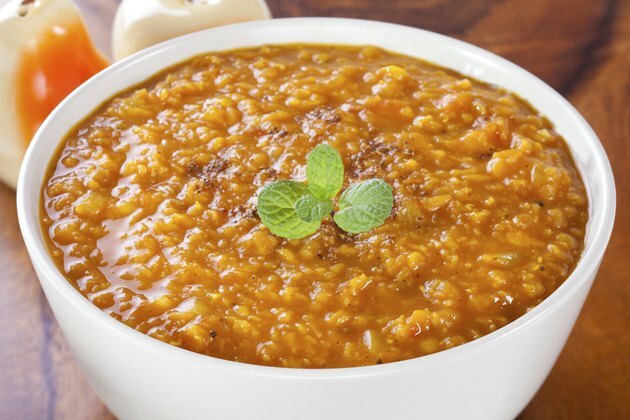 Other lentil soups may contain between 130 and 150 calories per cup -- or more, if you add ingredients like potatoes.